THE NATION’S fractious racial climate has always invited the good intentions of those who’d try to improve that climate, by just about any means necessary. Each of us in our own lives has had that fumbling but earnest opportunity to step outside his or her own (dis)comfort zone and take a stand for justice, equality ... or just having a conversation. Which makes the virulent reaction of Starbucks’ “Race Together” campaign both hard and easy to understand. On March 15 (the Ides of March, FWIW), the Seattle coffee titan launched the campaign, an effort to enlist the company’s baristas in provoking genial repartee about race and ethnicity among the customers at the thousands of Starbucks coffee shops across the country. 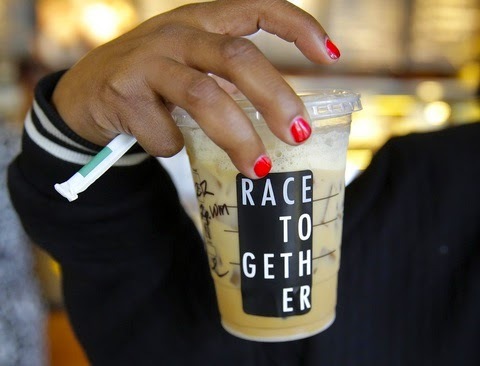 The baristas (as if they don’t have enough to do already) were also asked to write “Race Together” on Starbucks cups. Despite its appearing to come from a real place, the Starbucks overture failed in the days that followed. Customers weren’t having it; social media went batshit crazy with snarky reactions to the campaign — reactions that said more about the people writing them than the people they were writing about. Starbucks media machinery tried its best to spin it the right way. ““Leading change isn’t an easy thing to accomplish," spokeswoman Laurel Harper told The New York Times. But no: Starbucks CEO Howard Schultz formally pulled the plug on the project on Sunday, March 22. ADMITTEDLY, IT’S a serious stretch to expect people to weigh in in a meaningful way about race relations before they’ve had their first caffeine jolt of the day. Most of us don’t know our own names before that first blissful cup. But Starbucks tried its best to move the needle on this matter, the nation’s eternal blind spot, in a way that maybe its customers could get behind, if only for a moment. God knows Starbucks (2014 market cap $71.2 billion) doesn’t need any more publicity, so the idea of doing this as a stunt or a gimmick — as if Starbucks was a startup company— doesn’t really make sense. The campaign may have been ham-fisted, but it was apparently sincere. In this hyperpartisan time, though, reactions like the ones SBUX attracted shouldn’t have been a surprise to anyone. It’s an indicator of just how broken and angry we’ve become about even talking about race in this country. Even the valiant of misguided effort is subject to attack; good intentions are the work of bad actors. The next time Starbucks tries to push the envelope on cultivating a conversation on what’s still the country’s most combustible topic, or any other big concern, maybe Schultz will come up with a better forum than a checkout line for people waiting on their morning defibrillator cappuccinos. The topic of race relations in our raging nation deserves that forum. But a seemingly principled effort to inspire such a conversation deserves better than vilification. Image credits: RaceTogether cup: via NBCNews.com. Starbucks logo: © 2015 Starbucks Corporation. 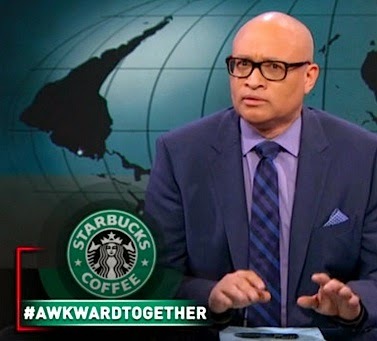 Wilmore: © 2015 Comedy Central. Tweets are the property of their respective creators. A SURPRISING byproduct of the growing number of minority-themed TV shows — not so much inevitable as unavoidable — has been an increase in depiction of interracial relationships through the TV spectrum. Risk-averse TV suits and the advertisers to whom they pledge allegiance have finally come around to accepting the country’s romantic complexion. Some people will say “what’s the big deal?” — a question more properly directed at the network executives for whom it was a big deal, for generations. And it’s not just the number of them. As a departure from the usual casting reflexes, the more-than-occasional interracial pairing is refreshing in and of itself. But the real separation with the past, the big break with our social and cultural history, comes in who plays what role. In the TV relationships, if not the series itself, there’s often a black male lead. Interracial romantic relationships have long been the third rail of the American racial dialogue, the unfortunate carry-over from deep in our segregated national history. In the bitter years after the Civil War, southerners and their sympathizers painted black men as rapacious defilers of White Womanhood, one of the poisonous, resentful rationales for creation of the Ku Klux Klan. 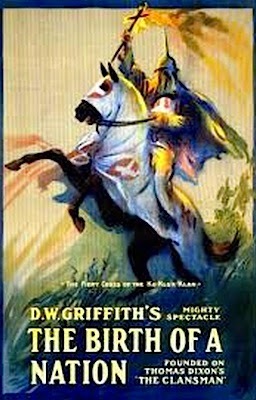 D.W. Griffith’s “Birth of a Nation” was notorious for its depiction of black men in just this way; his corrosive characterizations in the film (100 years old this month) persist into the present day. But in recent years, some series have stepped outside this comfort zone, with couplings that challenged the televisual status quo. It’s been de rigeur on ABC’s “Grey’s Anatomy,” in its 11th season; NBC’s “ER,” which ran for 15 seasons, did it as an earlier ensemble series. And it’s very much a part of the current prime-time diet. THERE’S A KIND of wave that hits our shores from time to time, makes its necessary and inescapable point, and then recedes. Well, that wave has returned anew. In the second season of Netflix’s “House of Cards,” lobbyist Remy Danton (played by African American actor Mahershala Ali) got engaged in a steamy relationship with Jackie Sharp, Assistant House Minority Whip (played by the white actress Molly Parker). In the runaway Fox hit “Empire,” Andre Lyon, scion of the founder of the Empire Entertainment (played by black actor Brai Myers) is married to Rhonda (played by white actress Kaitlin Doubleday); the couple’s navigating family machinations and personal challenges as the series heats up every week. In ABC’s new multi-storyline series “American Crime,” Elvis Nolasco portrays a meth addict implicated in a murder that resonates through a California community. Nolasco’s character, Carter Nix, is married to Aubry Taylor, played by Caitlin Gerard. Nolasco is black, Gerard is white. True, four or five high-profile departures from TV’s monochromatic romantic norm don’t necessarily indicate a trend. But their presence on mainstream television today — broadcast, cable, streaming — comes to this cultural crescendo at the very time when our collective real-life patience vis-à-vis matters of race and ethnicity has, to go by several recent events, run out. From the sad events in Ferguson, Mo., to the sadly astonishing incident playing out in Oklahoma over a racist song sung by members of the Sigma Alpha Epsilon fraternity, to the never-ending slights and indignities faced by President Obama, there’s still no limit to our pursuit of intolerance. That’s the heartening connection between what we see in prime-time TV drama and a series of disquieting national events. Even amid the downbeat storylines of each of these programs, there’s a hopefulness that’s implicit in their casting structure, a positive narrative that plays out in the context of the modern romantic relationship. As a society, we’ve reached, or are certainly reaching fast, a comfort zone with mixed doubles, a rapprochement with the past. THERE IS OPPOSITION to interracial pairings on TV and in real life, for sure, and a lot of it. But a society is often led to evolution by its cultural devices. 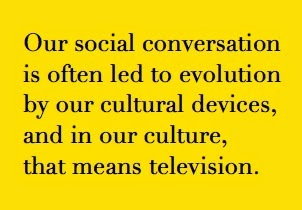 In our society, in our culture, that means television. The realities explored in each of these gritty, sometimes explosive series include that other reality: when personal and professional lives collide, they often do it regardless of race. The television business wasn’t always so accommodating of realities it didn’t understand; the change reflected in these programs and others that dance on that third rail at this angry American time is a cause for nothing but optimism. Some reactions to even writing about this not-exactly seismic shift in the teleculture will say it’s not necessary — for them, not talking, writing about or noticing the issue eliminates the issue. But that’s silly, certainly as far as modern American television goes. That’s like saying if you don’t talk about the weather, the weather will go away. That weather, and our emotional bandwidth as a nation according to the mirror of television, are changing at unprecedented speed. And that’s going to accelerate and keep going until these programs have company. Until the day when it’s not minority-themed programming anymore. Until it’s just programming and people ask themselves why depicting interracial relationships on TV was ever such a big damn deal in the first place. We may, may be closer to that day than we think. Also published at BuzzFeed Community. Still from “American Crime”: ABC. Still from “House of Cards”: Netflix/Triggerstreet. Still from “Scandal”: ABC/Shondaland. THE MOVIES, America’s indelible and undying contribution to popular culture, has permeated — some will say insinuated itself — into cultures around the world. The relentless motion-picture combine that is Bollywood couldn’t exist without the Hollywood that gave it every letter of its name but one. The globalization of the Hollywood visual esthetic has had its own benign unintended consequences. Directors from all over the world have taken it and transformed it according to their own singular visions — the Mexican director Alejandro González Iñárritu just won the Oscar for Best Picture doing exactly that, a year after the Mexican director Alfonso Cuarón won the Oscar for Best Director last year. And other filmmakers have adopted the Hollywood Look for years. And technology has played its part. Thanks to such video editing tools as the iMovie software included with iMac computers since 2003, it’s been increasingly easy for everyday people to create You Tube-ready videos with any number of top-shelf special effects. 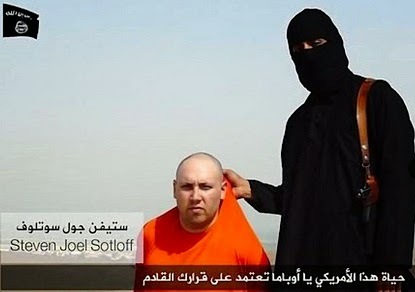 But lately, in a completely different world, that visual language has been corrupted — the only possible word — by the terrorists of Islamic State, or ISIS, whose videos of human beings murdered on camera has altered the terms of engagement between ISIS and the civilized world. In exhaustive, at times brilliant reportage in Sunday’s Los Angeles Times, Jeffrey Fleishman writes of how ISIS has appropriated the tropes of Hollywood filmmaking for thoroughly malign purposes. An excerpt: “The Islamic State's production values have steadily improved since the network grew in Iraq and Syria; it now operates or has affiliates across North Africa and the Middle East. The group's ranks have been bolstered by as many as several thousand recruits from Europe, which may be where the organization's videographers learned their trade. 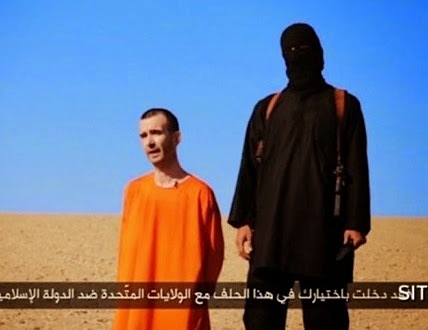 The videos, including those showing the deaths of American, British and Japanese hostages, have been frequently released since last summer. I WON’T undercut Fleishman’s work by attempting to boil it down here; it deserves to be read and enjoyed in full, on its own terms. I’d only say that it puts the power of our culture, its viral capacities, into sharp focus. 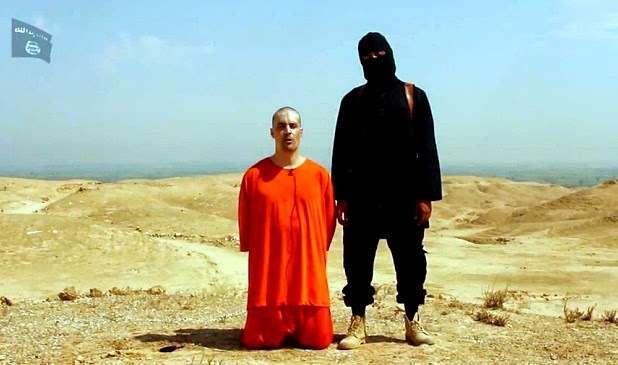 If you’ve ever had any doubts about the power of movies according to Hollywood, the ISIS videos you’ve surely seen over the last six months should have set those doubts to rest. 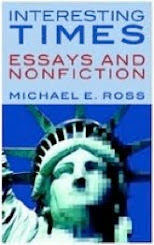 Fleishman’s story contextualizes what to the unenlightened eye might look like isolated anomalies — the work of terrorist directors fascinated with modern movie style — to reveal how consistently and poisonously well those terrorists grasp that visual narrative ... how thoroughly those killers have learned not just how to push our buttons, but exactly which buttons to push. BACK IN the day – in the days and weeks after the November election – it all seemed so clear, so simple, so obvious where things were going. 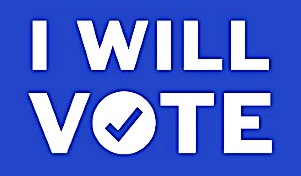 The Democrats — wounded, bloodied and chastened by a midterm election that overwhelmingly rejected them — would come back to a new Congress run by a newly energized Republican majority flush with success, bound to govern as a unified force and ready to mop up the marble floors of Congress with whatever was left of the Democrats. It was all going to be different. It was going to be better. That was the script, anyway. What a difference a few months makes. After coming back to Washington with a purported agenda to continue blocking legislation from the Obama White House while advancing the GOP agenda — especially on immigration — it’s all different. The Republican congressional majority may be a majority by party name, but the internal divisions that have plagued them for years – divisions largely hinging on old litmus tests of loyalty and ideological purity – show no signs of letting up. The latest example of this played out on Friday. The GOP-majority House of Representatives approved a stopgap funding bill to keep the Department of Homeland Security up and running ... for a week. It’s the same bill passed by the GOP-majority Senate that had already acquiesced to Democrats’ demands to keep President Obama’s immigration policies intact. The funding for DHS remains at current levels, with no layoffs or cutbacks in that vital agency, arguably the most important and public-facing federal agency in the wake of 9/11. The Republicans’ willingness to knuckle under on the DHS bill, bowing to Democratic demands, puts the lie to the wall of resistance the GOP was prepared to be after the November election. So does the opposition that Speaker of the House John Boehner, a long time in the crosshairs of conservatives, faced from Republicans, who rejected his bid for a three-week stopgap bill — preferring the short-leash option instead. THE SAME thing happened earlier, on Thursday, at the Conservative Political Action Conference, the Woodstock (or the Coachella) of American conservatives. Ted Cruz, the Texas senator who’s made a career of championing his independent political spirit, often to the consternation of his fellow Republicans, took to the microphone to declare himself a “disruptive app” on the party landscape, and to condemn his party’s elder statesmen. 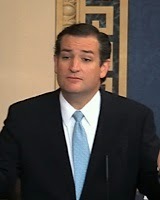 Cruz has a reputation of hewing to his principles, regardless of how it endangers the fortunes of his party in particular and the fortunes of the country in general. We all remember the utterly disastrous 2013 government shutdown Cruz presided over, and the one that happened about a year later. 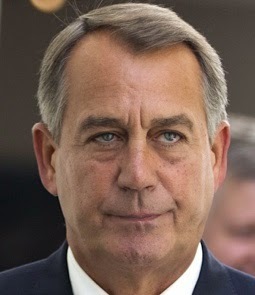 He’s swung for the fences and whiffed before — on defunding Obamacare, and pushing back against the immigration policy. Now, though, Cruz may be trying to straddle the fence on the DHS matter. On Wednesday, Cruz indicated he wouldn’t block an agreement between Democratic and Republican leaders to proceed with the bill to keep DHS operational. The same damn bill he condemned a day earlier at CPAC. Will the real Ted Cruz please stand up, please stand up? This latest evidence of bifurcated Republican identity showed up on Thursday. That was when some GOP lawmakers, standing on conservatives’ laissez-faire corporate principles, pushed back against the Federal Communications Commission’s decision to establish new net neutrality rules that seek to ensure all Internet traffic is uniformly regulated. Those Republicans conflicted with others of the party, who hope to hash out a compromise with congressional Democrats — imagine that! — amounting to a “resolution of disapproval,” an administrative expression of their discontent with the FCC’s sweeping ruling, which treats the Internet as a utility. The proposed resolution of disapproval is a down-in-the-weeds issue, and practically speaking it reflects a relatively minor difference between Republicans on the issue. But it’s just one more thing that points to a divergence of opinion in the GOP where there shouldn’t be one — one more proof of a disconnect we were led to believe ended last Election Day. FRANKLY, AND despite all the talk about a new Republican identity forged in the heat of last year’s election battle, we might have expected this. Our Congress, a legislative body long choked by pettiness and lassitude, has habits that are hard to break. But the difference goes beyond lawmakers on Capitol Hill. The matter of immunization is one of the hot-button divisions announcing itself in the slow but steady runup to the 2016 presidential election. On Feb. 2, Bloomberg Politics reported on where two possible GOP contenders for the nomination stand on the matter: opposing sides. "Although I strongly believe in individual rights and the rights of parents to raise their children as they see fit, I also recognize that public health and public safety are extremely important in our society,” said Dr. Ben Carson, a well-known neurosurgeon and conservative speaker, wrote in a statement to Bloomberg Politics’ Steven Yacchino. There’s more. 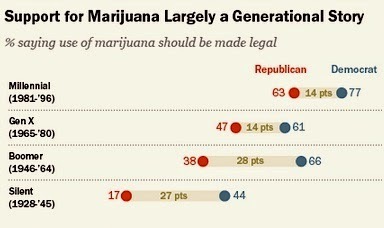 The wave of laws governing recreational marijuana has created a split between younger and older Republicans. On Friday, the Pew Research Center released a survey that found that 63 percent of millennialls who self-identify as Republicans favor pot’s legalization. It’s a marked departure with their older counterparts: the survey found that 47 percent of older Republicans (35-50) support legal pot.